The first story is mine to tell: the doorbell rang at 2 o'clock in the afternoon, it was a Saturday afternoon and I was sitting with my family around the table, we were chatting and I was sipping a cup of tea. Parked downstairs was the car we had rented for the weekend in order to go exploring with my parents who were visiting from England. I answered the door and it was a male voice I didn't recognise asking for me. 'Yes', I said, 'that's me'. 'You left your bank card in the parking machine downstairs', came the reply. I went downstairs and was met by a young man who had been walking along my street, saw the bank card in the machine and went around the apartment buildings in the near vicinity looking for my name so he could return it. I was stunned. Grateful, obviously, but nevertheless taken aback by his honesty and the fact that he had given time to finding where I lived. Of course, the part of me that is unaccustomed to living here and still lives like a Londoner wondered if my card had been used before it was being returned! But, really, what would be the sense in that? I simply had to accept that standing on my doorstep was the face of honesty. It even laughed at me when I offered a beer in return for the kindness that had taken me by surprise. Happy to be reunited with the card I didn't even know had been missing, I felt a huge sense of relief. The other story is simply this: the doorbell of a flat in a different neighbourhood across town rang at 2 o'clock in the afternoon. This was also a flat with a shared entrance, the young family that lived in the flat were out save for the father who was busy and so he didn't answer the door. The doorbell rang again and again he didn't answer. Moments later two men used a crowbar to break in through the front door. At this point the father appeared and upon realising the flat was occupied, the intruders fled. When I think about these two events, I struggle to reconcile them. Compared to living in London, I feel relatively safe here in Copenhagen but I also try not to take those feelings for granted, to be careful about security and to play my part in keeping this city safe. This morning my daughter started ballet school and if you've even been a mother of a little girl at her first ballet lesson, where its all pink and tutus and ooh and aah, then you'll know the place of which I speak. Nothing could prepare me for it. My daughter had been dressing up in her 'dancing shoes' and prancing around in various mock ups of a ballerina's wardrobe for a couple of days but there's something very different about being in a room full of such little girls. It was one of those moments. The school we have chosen for her is in Christianshavn and so it was a merry little jaunt on the bikes from Østerbro on this sunny Saturday morning and what a wonderful way to start the day. But the energy and excitement for what lay ahead did not dispel the need for a wake up shot of caffeine and I decided that the best place for this pitstop would be the original Lagkagehuset on Torvegade. 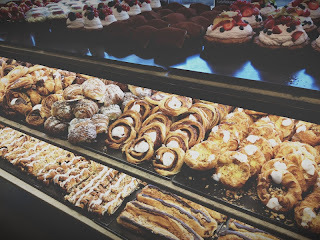 Now that I am writing up my experience at what has apparently been voted one of the best bakeries in the city, I am struggling to find testament to support the urban myths that surround this place. 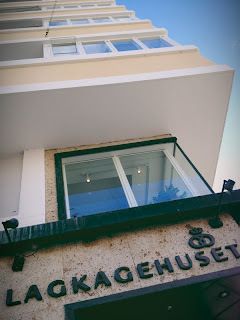 During my time here I had heard (although now I cannot verify) that lagkage is a layered cake traditionally eaten on birthdays and the building that sits at the junction of Torvegade and Overgaden oven Vandet (shown in the picture above) reminiscent of such a lagkage, was the first bakery to open in the group and gave it its name: Lagkagehuset (the layer cake house). 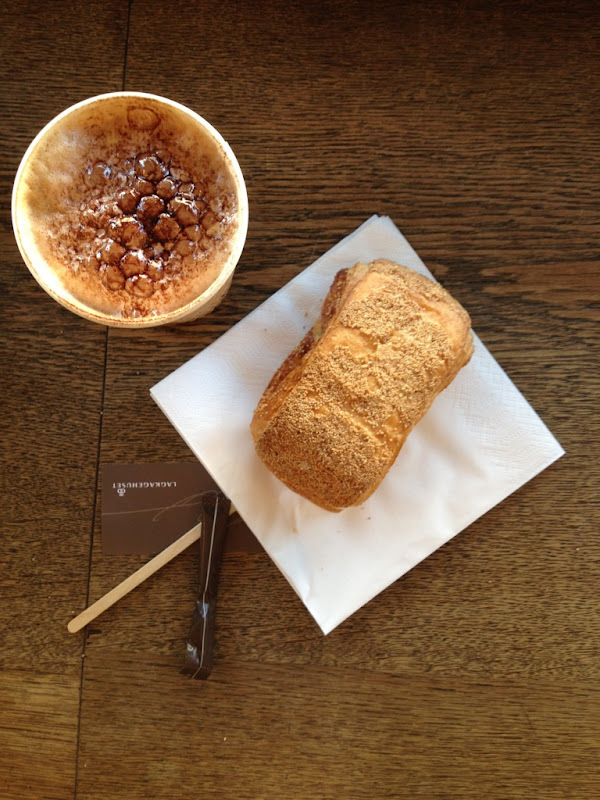 In any event, here it was that we made pilgrimage and enjoyed coffee and a pastry before the morning's fun began. Lagkagehuset can be found all over Denmark and their branded colouring with the famous signatures of the founders, Steen Skallebæk and Ole Kristofferson, can be a comforting sight in moments of need. Their bread is really what puts them on the map and they boast that most of it is allowed to rise for 12 hours. Be prepared to pay though as this labour of love doesn't come cheap. And, of course, they are the creators of the cursed 'chokoryg' - is it a chocolate roll with rye in it or a rye roll with chocolate in it? Either way, the mention of 'rye' and it immediately made an appearance on my list of 'healthy'(er) snacks! Be warned, they are not for the faint hearted or those, like me, with no self control. Is it possible to be unwittingly in the presence of a celebrity? If you don't know that the person sitting next to you is famous, are they stripped of their celebrity status? In other words, are famous people only famous to the people who know them or do they become 'inherently' famous? These are the questions that started doing laps of my brain as I sat down for my coffee in the beautiful organic bakery on Rosenvængets Allé, Det Rene Brød (The clean bread). I hadn't intended to have a philosophical discussion with myself but I was making notes on a book I had read on Søren Kirkegaard in preparation for my Danish test and I guess my grey matter was on overdrive. As I buried my head in my work, I looked up from time to time to sip my cappuccino and in doing so became aware of the beautiful people gathering around a particularly beautiful man sitting at the window to my left. I had no idea who this man was but I got the sense that he was someone I should know (or at least, know of). Famous people have that air about them - sometimes they carry themselves with an aura of 'you must know who I am' but other times it isn't their behaviour but what they inspire in others: the nervous giggles and blushes; the body language of mortals in the presence of greatness. Well, as I had no clue as to the fame (or infamy) of my fellow coffee drinker, I continued to simply observe as the anthropological drama played itself out. Its essence was lost on me. I wouldn't suggest that anyone visit Det Rene Brød in the hope of a celebrity spotting - go for the coffee and for the pastries - you won't be disappointed. And if are lucky enough to find the place quiet, then the experience will be complete. 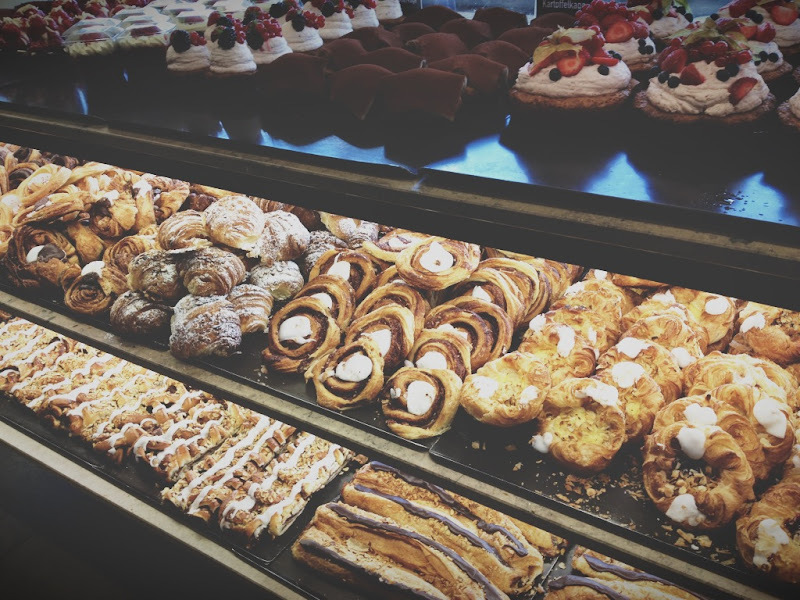 Det Rene Brød prides itself first and foremost on its organic bread and pastries, which, it promises, are better for you and for the environment. The coffee is not the main attraction but it plays a perfect accompaniment and is reasonably priced.